Meet Cecele Cournede! 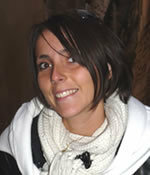 She is from France and studies the physical properties of the sedient! She is learning lots of new things on Expedition 342! What is her favorite food from the galley? Has she seen any marine life? Guess what? She is great at drawing the JR!